Race Concepts , a relatively new name in the Hot Rodding community in India. Headed by Joel Joseph , who provides real world performance mods for Indian Bikes within reach to the common person. All of the mods are vehicle specific and mostly all are plug and play. I had been following his work for quite some time, and then my bike(Pulsar 220F) got it’s Exhaust damaged and i had the perfect excuse. I got myself one of these babies. So, this is a full detailed review after 24,000 kms use-age of the Same. It’s a completely Un-Biased review. I got hold of Joel’s email id and send him a mail. Reply was prompt and with all the required details was given. Joel had promised me a 15% bump in power and a 5% increase in fuel efficiency. For me it was good enough and I took care of the finances . Delivery was a bit of a problem, it took more than the promised time, Joel claimed he had some emergencies and was short on staff, it was quite understandable as he was doing most of the work himself and was getting a load of orders, but the delivery took much more than I expected. But through out the time, he was always quick to answer my queries and that was indeed a good thing. Now lets get to the review. The exhaust is much smaller and very much lighter than the stock exhaust. The finish seems quite good , and personally I love the looks of this one, though many people who I have met feel it looks weird, but looks are a personal choice so it differs. Now let me shed some light on the down side, the body is not Stainless Steel, so using it in area’s with more humidity or coastal areas will attract quite some rusting after a few months of use-age, personally I too have rusting issues on my exhaust, though it’s not that serious. The rusting issues can be taken care of by powder coating the exhaust, which shouldn’t cost more. But, Joel has now come up with new batches which are Stainless Steel, so that part is taken care of, but it surely will cost more. As I mentioned earlier each of the products are custom build to fit the specific bike, so the exhaust is claimed to be a direct fit and a plug and play system, and sure enough, all that was needed was to swap it with the stock exhaust, the fitting point was perfect. No fine adjustments were needed while fitting. So we can get that the product was made specifically for the 220F. A downside in this department, well it doesn’t exactly qualify as a downside, but the main stand stopper is useless in this case, the stopper was way off the position where it should be, but since it was welded onto the exhaust correcting it was not possible. But to my surprise, the main stand dint hit on the exhaust either, which was fair enough for me. Note: The double stand stays at a higher position than when it was with the stock exhaust, as the stopper is not present here. I’m not sure if this problem is solved with the new gen exhausts. A very very big part of this review. I had listened to many video’s from users and sure enough never got the real feel of it no matter how good earphones I used. And I never had the chance to hear one in real life. So it was the first time I was going to hear it when I was getting it fitted on my bike. And I had removed the DB killer (more on that soon) so that I will hear the best sound of it the first time rather than the held back sound. The bike cranked up on the first try and Boy, was I blown away or what, this is when I was sure that I had spent the money on the right thing(at that time). The sound was just crazy, it had transformed the 220 completely, it din’t even sound remotely close to the stock and the sound quality was just so much better than the locally manufactured one’s. Sound wise this product was really a great surprise, I never had expected this kinda sound. It is sure to made head’s turn and astonished looks(annoying one’s too at times). So in the sound department it’s a 5/5. Now, the exhaust comes with a removable DB killer. Which is fixed onto the exhaust using 2 allen screws. It can be fixed or removed within 1 min, with the proper sized Allen-key. The DB killer does reduce the sound by a considerable amount, sounds closer to stock, but with a more beefy sound and that too is a great sound. A point to note here is that, the allen keys if not tightened properly can fall off due to vibrations. Here is a video clip of the start up video i have uploaded, this is without the DB killer. But this area too comes with it’s downside. All aftermarket exhausts use Glasswool/Fiber Glass to muffle the sound and these are heat resistant materials too. This exhaust had glasswool filled up in it, and glasswool gets used up , as the glasswool level gets depleted the sound changes, and you get a feel of vibration from the exhaust. The life of the glasswool completely depends on the use-age of the exhaust, if you rev the bike a lot and always in the higher revs , the wool gets used up fast, moderate use-age should keep it lasting for longer. If it is any better to hear, the refill won’t be heavy on the pocket, it is an easily available product , from refrigeration shops and refilling doesn’t take much time too. The newer gen exhausts comes with Fiber glass , which is loads better than the glasswool , better lasting and better sound insulation too. So this part has also been taken care of by Joel. This is the most important part, the one that really matters for enthusiasts.Partly the reason why i’m writing this review after some 23-24k kms use-age, so the review can be considered relevant. Building a exhaust is not child’s play. These are numerous calculations to do and a lot of testing to be done to hit the perfect working for a particular model of vehicle. Many factors such as back pressure of gas, tube length, header pipe length, end can length and pipe diameter and what not. And certainly Joel has done his homework on this part. As per Joel, he had promised 15% bump in power and a 5% increase in fuel efficiency. Sounds a bit too good right ? 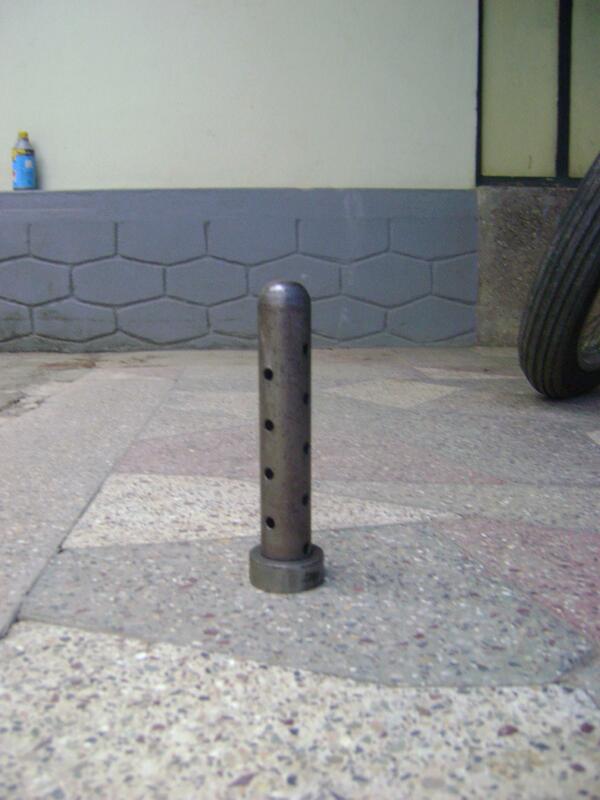 The general taboo here that using a FFE gives the FE for a toss, that is the case with the locally made canisters, where the pipe lengths are not properly maintained . Coming to the RC exhaust, every single word of what Joel claimed is true. It gives a big boost in performance and amazingly enough i get better fuel efficiency than other bikes. The exhaust does what any Free Flow exhaust should do, the bike breathes out very freely, the revs climb up so fast. First time riding , it was a bit tough to handle, a small twist of the throttle makes the bike jump forward, it’s quite overwhelming at first, then you get a hang of it. Though many argue, the use-age torque is lost as t climbs the rev range so fast, but i differ here, the sweet spot of the 220 is after 6k rpm, to put in precisely at 7k to 9k , using it accordingly will help in tapping out the real full potential of the otherwise stock bike. It is to be noted that , the exhaust alone does not increase the top end, but just helps in getting there better, the acceleration is crazy enough(the stock 220 does has a crazy acceleration on itself, this makes it even madder) . The bike does not knock in lower rpm in higher gears, it can pick up without any hiccups from speeds of 29-30 kmph in the 5th cog, which is not possible on the stock exhaust setup. Accessing the difference with the stock. The low end torque was increased, knocking issues were no longer present, it would easily pick up from low speeds at higher gears without knocking. The mid range is the sweet spot on the 220, post 6k rpm, the power surge is addictive on the stock ride, it gets even crazier with the exhaust,the bike used to be sluggish closer to the redline, but now it revs up easily, which is kinda obvious. I have recorded over 52 kmpl consistently under mixed riding conditions of 60% highway and 40% city, where the city area was filled with numerous gear shifts.This is more than even stock 220 users. Note : The figures are with a properly maintained bike, proper tire pressure, proper chain slack, clean air filter. Needless to say, it is a great product, but before investing in such aftermarket parts, one must be very clear on some point. Aftermarket performance parts always puts more pressure and increased wear and tear on internal engine components or the moving parts to be exact. The stock parts are designed to take the abuse of the stock parts complementing it, when we swap these with performance parts, it definitely makes the other parts work over time to match its working range, which obviously points towards faster wear and tear, or the only solution is to get the concerned parts changed too. This is a free flowing exhaust, helps in free revving, so naturally the bike breathes out better, at the same time one must consider the fact that using such equipment puts stress on the rotating parts in the engine mostly, the valves, rockers and cams. The stock parts are designed to take the abuse that the stock exhaust hand out, with a free revving exhaust these parts work over time, so early wear and tear of such parts are part of this game. A free flow will put more pressure on the valves , in turn on the rockers and by default on the cams too. And with the free flow means more frequent gear shifts, so increased wear to the transmission is also possible(not in a extreme manner, but it can be considered as premature wear). So please be educated on these facts before you invest on aftermarket parts. The wear caused cannot be said to be a drastic effect, it reduces the life of the parts by a small margin, so you might require to change a few parts sooner than on a complete stock bike. Though these parts are very much reliable and have not failed me in all these kms of use-age , it can never provide the stock reliability, the stock parts are perfected over hours and hours of R&D , with long life as the main factor, while aftermarket parts like these are designed with extreme performance in mind. This must be perfectly understood before hot rodding a bike. The reason I mentioned this here is because a lot of people are un-educated on this front and end up with worn out parts and the blame goes to the aftermarket parts. I was completely aware of this fact and I went forward with the purchase of this product, so mine was an informed purchase. So to conclude the performance part. The product is a complete bang for the buck in terms of sound, performance, every word promised by the manufacturer is kept up in terms of performance. Though, a little room of improvement was there for the quality of the materials used to build up the product and the glasswool issue. All of which has been taken care of in the newer gen exhausts. So a well informed ,educated purchase of these parts will newer let performance hungry guys down. So here I am concluding the long term review of the exhaust, Anyone with any queries can leave a comment below and I’ll get back to you soon. P.S : If you are unable to find reviews for a particular product , and wish to get a review,of the same. Then do write to us at : wheelsnshields@gmail.com , and we will respond to you and try to arrange a full blown review of the same. 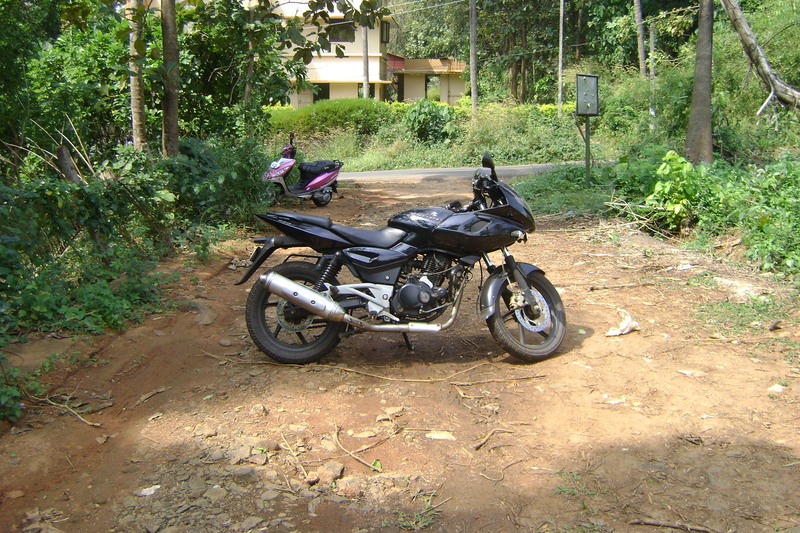 hi the review was useful i own a pulsar 220f i need some upgrades for my bike to race can u suggest some? You can contact him through his website or email id. Also there are more options now for the 220. A few shops in Bombay are providing it. How much did it cost you. And is there any waranty. For cost and other related queries contact Race Concepts. I was searching for a custom made exhaust for my pulsar and the search ends here. I am impressed with performance parameters and sound too in video. I just wanted to know the price of the exhaust. As mentioned in the review. For prices contact race concepts. Prices have differed over time,so i cannot provide a proper quote on it. where should i buy this exhaust.. ? email me the details please.. Details to buy and email id has been mentioned in the review. You can get details from there. Hey plz tel me Wt abt daytoNa dargex exhaust ? 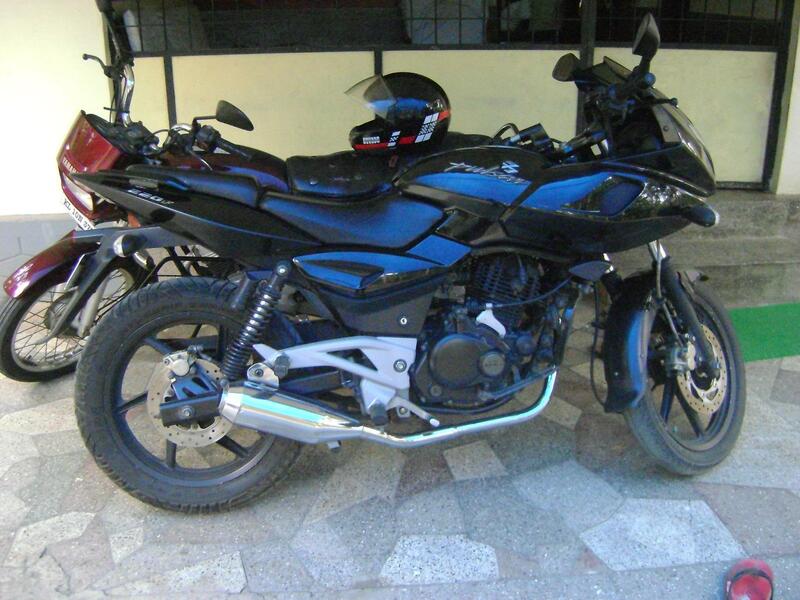 It iz gd fr pulsar 220f 2014 mOdal ???…. I m looking to change my Digital Pulsar 180 stock exhaust to RC. 1. My location is Pune so from where do I purchase this product. 2. Will this RC exhaust match with my bike. 3. How much it will cost me. Your help will be very much appreciable. 1. The Exhaust is ordered from Bangalore, so you must get in contact with them via email or call. Details is available in their website. 2. I do remember them manufacturing products for the 180, but do conform with them , as I do not know if they continue making it or not. 3. Again, I have no idea on cost. P.S: I do have to warn you that after sales support form Race Concepts is really bad and if you need to replace the product or some other issues, you might face a tough time. I am saying this on the account of too many people who have voiced this opinion. So please make an informed choice after doing proper research. Thanks Krishna for the valuable information. After reading all this information I don’t think its gona work for me, but still I will try to contact them. If possible can you pls guide me. 1. Which will be the best exhaust for my bike. 2. I m desperately looking for a change. I feel sad to see that stock exhaust does not work well and it hamper the bike performance. 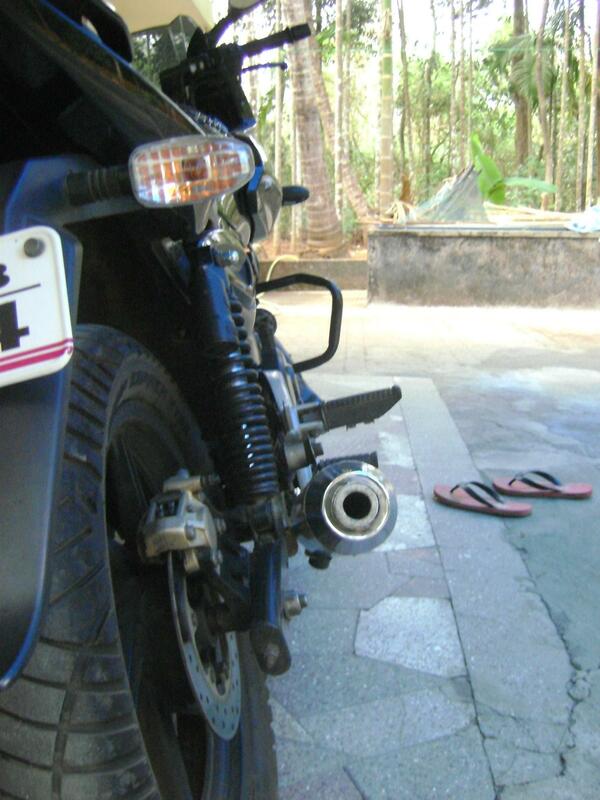 I am not sure if there are any exhaust tailor made for the pulsar series. The only option that I am aware of is the Race concepts model and I already explained the risk of going forward with them. You might get some other options if you visit some decent tuning shops in your locality, they might be able to fabricate a free flow exhaust for you. How good they are is something you must find out from feedback of people in your locality who have used those before. I guess you are running very lean with this setup, inspect your sparkplug and be sure. If it is running a optimum mixture then it’s great. 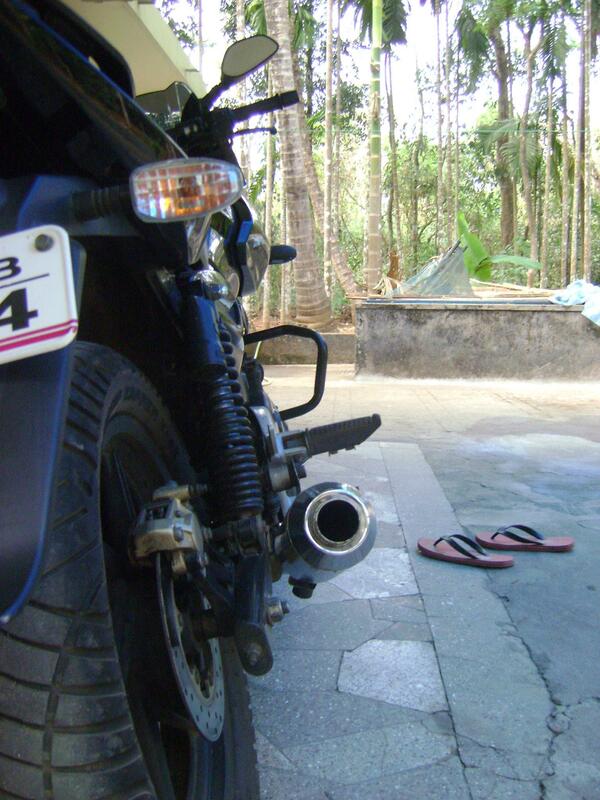 Hey bro….wats d top wack aftr these mods..?? My stock 220f goes 151kmph..,,,,all i get any improvement in this??.. Could you please arrange such an unbiased detailed review (including the technicalities along with the pros & cons) regarding an after market exhaust for the FZ16 (carb version)? if i just change my pulsar220f stock exhaust so does it will affect the engine parts of bike ¿? What is the name of exaust and what is your email id?? You can contact Race concepts for details of the exhaust. Google can help with the details. What should i type on google for the details of exhaust ? Hey….Plz upload a video on how to adjust the afr on 220f..it gets really confusing on which screw to turn and in which direction…A vid will certainly help the cause! Thanks! if any sc project or akrapovic exhausts for pulsar 220?if its available? 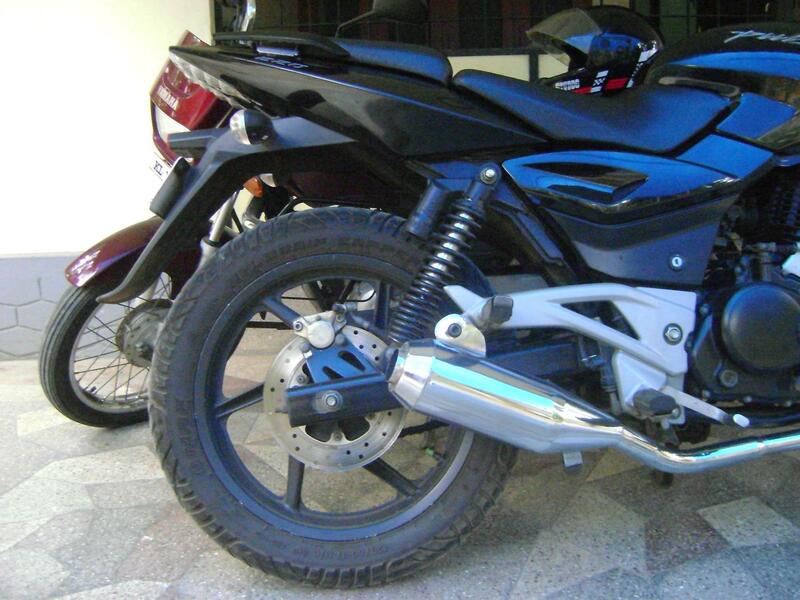 Hey I want to know that what will effect of a high performance exhaust on the mileage of pulsar 220f plz tell me on ..